Constructed of a solid brass faceplate with a decorative nickel plated finish. Available in 21 different sizes to suit most needs. These solid bronze decorative wall vents will look great in any home. Each bronze wall register comes with a fully adjustable damper to control airflow. Available in 21 sizes. 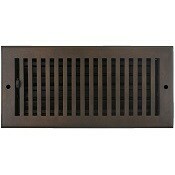 This Hamilton Sinkler Pasadena design register has a durable powder coat finish and offers an adjustable metal damper.The faceplate is made from aluminum. You can choose from nine different sizes to suit your needs. Solid bronze wall register available in 26 different sizes. Each decorative wall vent features a scroll design in a beautiful bronze patina finish. Solid brass vent featuring a diamond decorative pattern. The decorative wall register has a plated antique brass finish. Each solid brass vent comes with an adjustable damper. Several different sizes to fit your needs! This Hamilton Sinkler decorative wall register is an excellent choice and durable since it has a solid brass core. Available in 9 different sizes to suit most needs. Solid decorative wall vent in a hard-to-find chrome finish. This chrome wall register is both durable and attractive. Available in 9 different sizes. The Hamilton Sinkler "Strathmore" sidewall register is crafted of solid brass with a polished brass finish. This register is available to order in 9 different sizes.